Hi everyone! Calaera here. Do you ever think about where Carbuncle comes from? No, not the folklore or the in-game lore that surrounds Carbuncle. Pfbt, please. That’s what ‘normal’ people do. Have you listened to the folks on this podcast? Yeah, anything but normal. Write as short or as long an email as you want telling us where they are born from. Don’t be boring and write about the lore. You can write something absurd like, “One day mommy Hydaelyn and daddy ______ spent one fantastic night together, etc….” Entertain us. Please, entertain us. If your entry is boring as hell, you can be sure we will hit the delete button and there goes your contest entry. 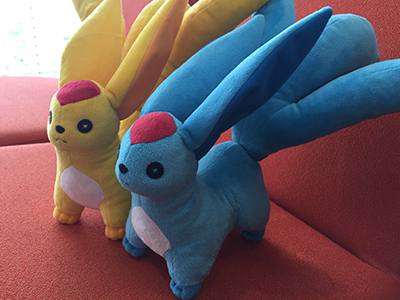 The entry that is the most entertaining will be awarded the prize of one stuffed Topaz Carbuncle which will not only be your companion in real life, but in game as well with an included in-game code! The deadline for this contest is July 31, 2015 and is open to everyone world wide!